Judging by the few responses, I guess this was another difficult drawing for you caption writers. A few people actually told me that they stared long and thoughtfully at the drawing and came up absolutely blank. That surprises me, since there were so many "props' in the drawing to work on. 1) "I don't mind the in-box, but I hate it when he asks me to take a letter." 2) "It started with a three martini lunch, but he's a classic overachiever." My original caption: "He comes in every morning at nine sharp, sets those things down and leaves exactly at five." So congrats to John Platt (1) and Richie (2) -- you're two of the funniest guys around. Actually, all three of John Platt's captions brought smiles to my face. I also appreciated D. Mancino's attempt to inject the legal Bar into the caption -- it almost worked. And I liked Andrew's reference to "the happy hour rate", and Gary's reference to "beeping laptops and noisy cell phones". Nice thinking from all of you who participated -- sorry you couldn't all be winners. I'll be sure to select a simpler, more general drawing for the next contest. For a short time a few years ago, I was going in regularly to show my cartoons to Bob Mankoff at The New Yorker. 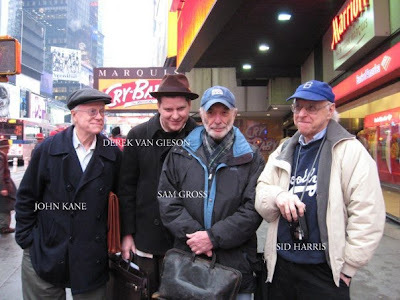 As it says in the linked article, I was also made to feel at home by the likes of Sid Harris and Sam Gross and by a guy, up in years like me, who I had really never heard of before . . . John Kane. One Tuesday in the waiting room, John was passing around his copy of a hard-cover New Yorker collection of cartoons for everybody to autograph. He eventually passed it to me. I demurred, telling him that I was never actually published in The New Yorker. John's simple response was, "Oh, but you will be." I stubbornly didn't sign the book, but his gentle words have stayed with me, and I wish I could have told him how much I appreciated them. This was another cartoon of mine published only in the Western edition of National Review magazine, and not in the full edition (for reasons unknown to me). CEDR stands for the Center on Evaluation, Development and Research, and the Forum was an educational newsletter. I'm not sure if the CEDR is still in existence, but the parent company was Phi Delta Kappa, publishers of Phi Delta Kappan magazine.